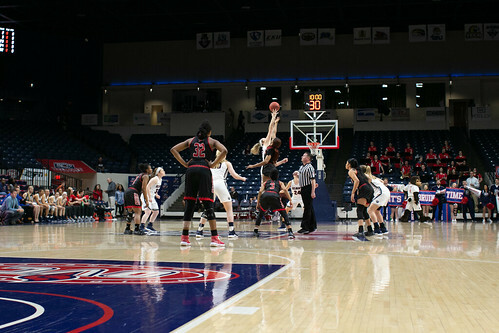 The Belmont women’s basketball team completely destroyed Southeast Missouri State 91-57 on Thursday night at the Curb Event Center, extending the team’s win streak to seven. The Redhawks didn’t show much life, as the Bruins controlled the game from tip-off. SEMO only shot 34.4 percent from the field and 15.8 percent from arch. Belmont junior Maddie Wright was one of the biggest contributors to the Bruins’ victory and has continued to be one of the team’s most important players this season. Wright scored a career high 20 points. Senior Darby Maggard scored 17 and picked up six assists. Juniors Maura Muensterman and Ellie Harmeyer both scored 16 points. Muensterman also grabbed 14 rebounds. With Thursday’s win, the Bruins improved to 8-1 in the conference and 15-5 overall. Belmont will face UT Martin in a 2018 Ohio Valley Conference Tournament Championship rematch on Saturday at 5 p.m. at the Curb Event Center. Photos by Carina Eudy and Chloe Eberhardt.